Fight back against heartless tailgate thieves! Keep them from wrecking your bank account, workday or pre-game party with the Master Lock TailgateLock. It features effortless installation, corrosion-resistant construction and anti-rattle pads. Lowest Prices for the best vehicle locks from Master Lock. Master Lock Tailgate Lock for Pickup Trucks part number 8253DAT can be ordered online at etrailer.com or call 800-298-8924 for expert service. Fight back against heartless tailgate thieves! Keep them from wrecking your bank account, workday or pre-game party with the Master Lock TailgateLock. It features effortless installation, corrosion-resistant construction and anti-rattle pads. The Master Lock TailgateLock is an affordable and efficient way to deter the theft of your truck's tailgate. It is easy to install and does not affect normal tailgate operation. The locking jaws fully enclose one of the tailgate's mounting posts on the truck. Lock the unit and walk away enjoying the peace of mind that comes from knowing your tailgate is secure. Today were going to review part number 8253DAT. This is the Master Lock Tailgate Lock for pickup trucks. This Master Lock Tailgate lock is an affordable and efficient way to prevent the theft of your trucks tailgate. Its easy to install, does not effect the normal tailgate operation. The locking jaws will fully enclose one of the tailgates mounting posts on the truck. You lock the unit and walk away knowing that nobodys really going to take your tailgate off your truck. 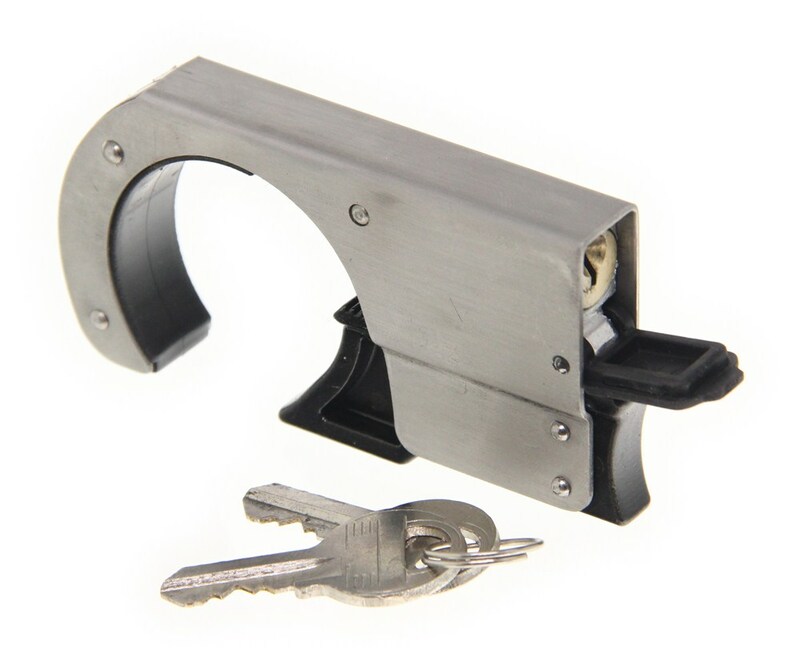 This heavy duty lock is a stainless steal construction, which is durable and resist corrosion. Does have a nice key way cover right here on the back, which you can flip open and have access to the lock. This key way cover will shield your lock from moisture and dirt. Its a simple installation, basically what this will do is right here, this will attach around the tailgates mounting post on the truck, and once you lock it down you can use the tailgate as you normally would this will just keep anybody from pulling the tailgate off the truck. 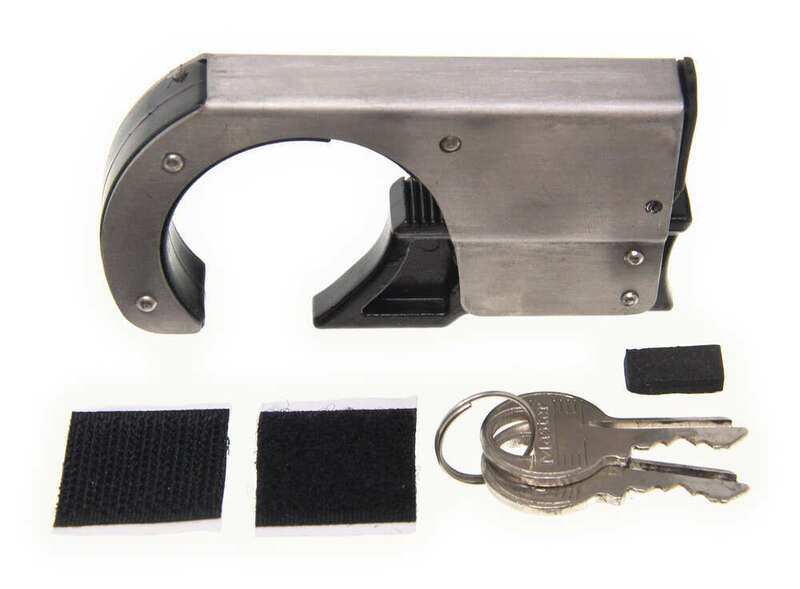 Does come with two keys, and it does include a few Velcro pads which can be used as shims to prevent the lock from rattling. Does come with a limited life time warranty. Just show you real quick if you put the key right in there, there we go, just turn it a little bit, that will allow you to push the jaws completely out to let it go around there. Then if you just push it back in to around, to the spot you need it, pull the key out, that will keep that jaw locked in place. Put your cover over the lock, and that will lock the jaw into place around the tailgate mounting post. That should do it for review on part number 8253DAT..
Order: RelevanceNewestRating - High to LowRating - Low to High Fight back against heartless tailgate thieves! 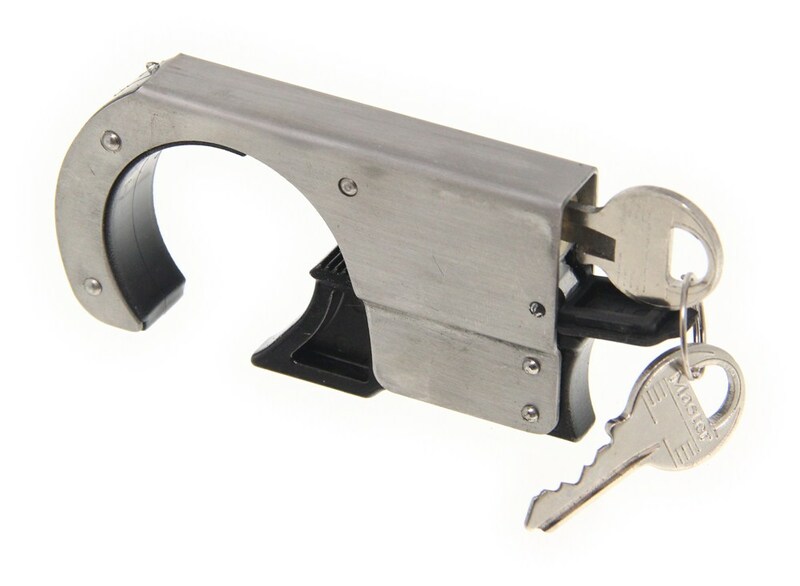 Keep them from wrecking your bank account, workday or pre-game party with the Master Lock TailgateLock. It features effortless installation, corrosion-resistant construction and anti-rattle pads. The locks are still working great. Ive had no problems. Its great I can sleep and know that the tailgate will still be there in the morning. Its horrible to find it gone!!! Did you use two locks one for each side or do you think that one lock is enough? One tailgate lock would be enough. Take a look at your tailgate and make sure that one side is slotted, the other should be enclosed. So once you lift one side out of the slot, you can pull the pin out of the enclosed side. Make sure that you install this tailgate lock on the slotted side, so that your tailgate can not be removed unless the lock is disengaged. I do know how install this lock if I bought it. If you had a video of how to install it I think you would have more sales. If I cannot install it will you send me a RMA to return it. great, still does its job, and I dont notice any rattle back there even though the velcro has come off. We offer several tailgate locks for your 1993 Ford F-150 that are shown on the linked page. These different locks are made for either a steel handle or a plastic handle tailgate. 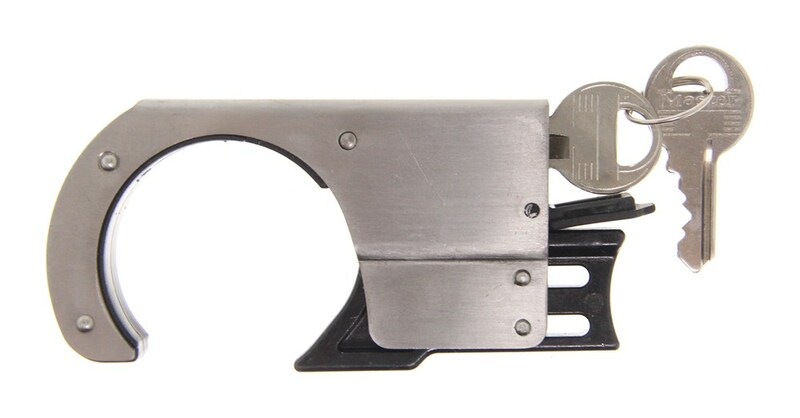 For example, for a steel handle you can use Pop & Lock manual lock # PAL2300 or for a plastic handle part # PAL2310. For a powered lock you can use # PAL8200 on both plastic and steel handles. Master Lock Tailgate Lock # 8253DAT does fit some F-150s but not your model year. We actually went out and tested the Master Lock TailgateLock # 8253DAT on a GM truck of the same generation as yours and found that it worked flawlessly. Check out the video I attached that shows me testing it on a 2005 GMC Sierra. The Master Lock TailgateLock # 8253DAT is designed primarily for late-model trucks but it is confirmed to fit a 1996 S-10 pickup but not a 2004 Chevy Silverado pickup. For the 2004 Silverado you can use # PAL1100. I spoke with my contact at Master Lock and he said the Master Lock TailgateLock, part # 8253DAT, is a fit for your 2004 Chevrolet Silverado. 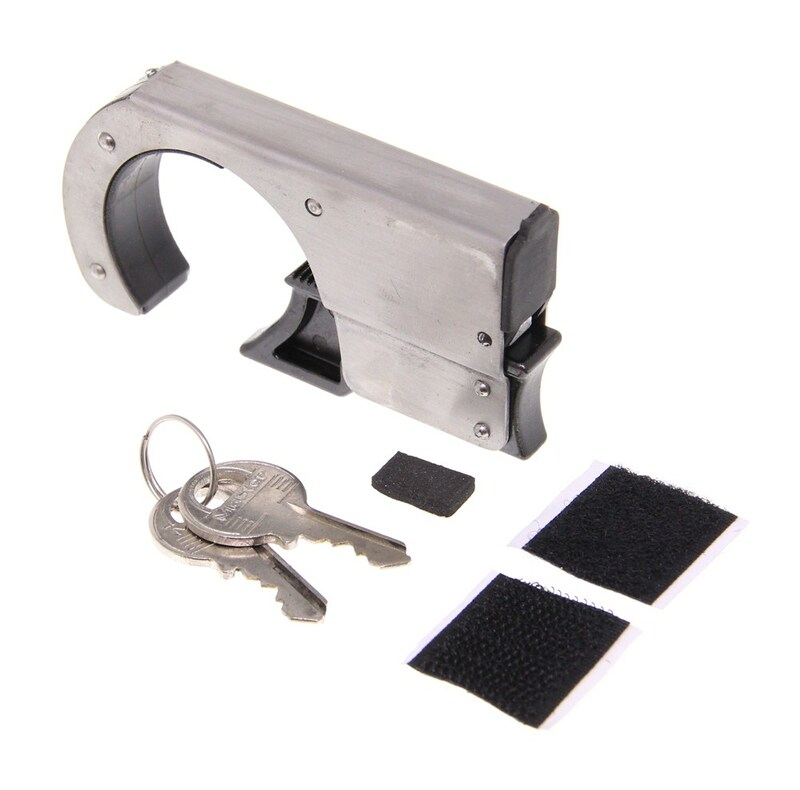 This lock is made of stainless steel and includes Velcro pads which will prevent rattling. 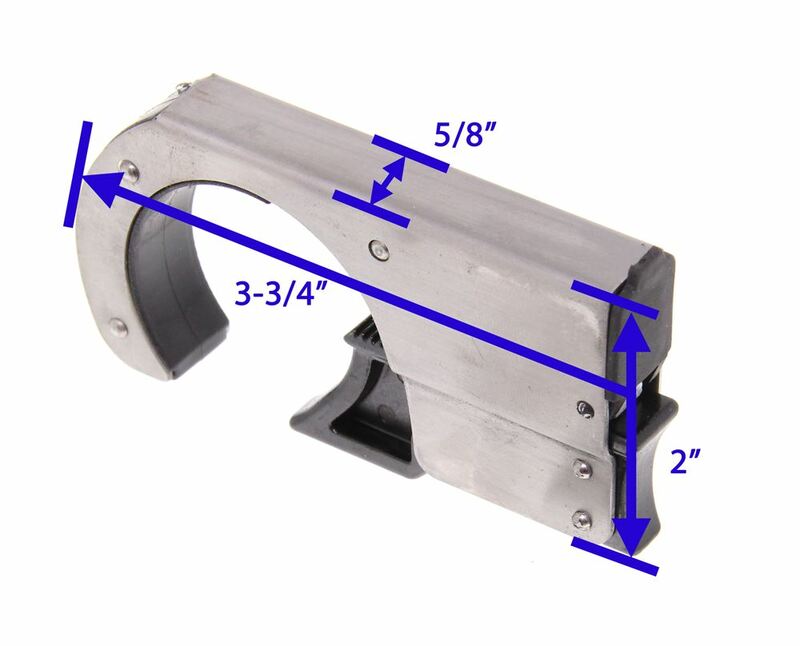 The dimensions for this lock are 3-3/4 inches x 2 inches, and the thickness is 5/8 inches. I have linked you to a product review video for this lock. I have taken measurements of this lock and have attached a photo showing its dimensions. 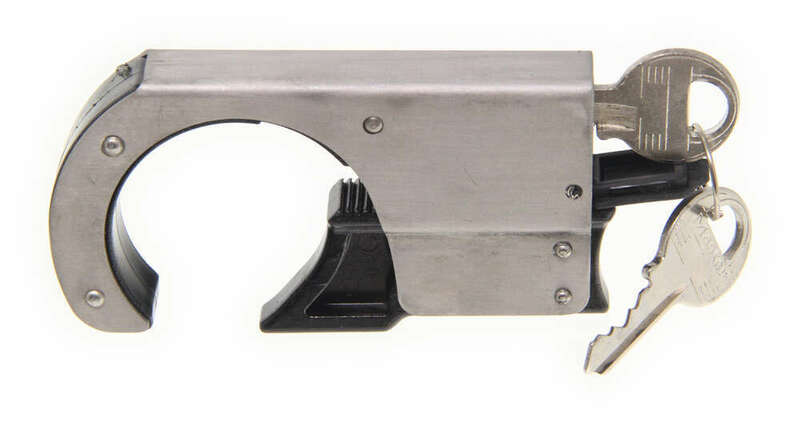 The most cost efficient tailgate theft deterrence device we have for your 2001 Chevrolet S-10 Pickup is the Master Lock Tailgate Lock part # 8253DAT. This lock is a confirmed fit for you truck and will work well for you. It comes with 2 keys and a lifetime warranty. I have attached an install video of the above lock for you as well. The Master Lock Tailgate Lock # 8253DAT that you referenced is a correct fit for all models of the 2002 Dodge Dakota. Please note that we also offer a power lock option for your truck (if it is equipped with power locks), the Pop and Lock # PAL8100. This lock wires into your truck's power lock system and installs without drilling. Yes, the Masterlock Tailgate Lock part # 8253DAT is a universal tailgate lock that would work great on your 2016 Ford F-350. I attached an install video for you to check out as well. 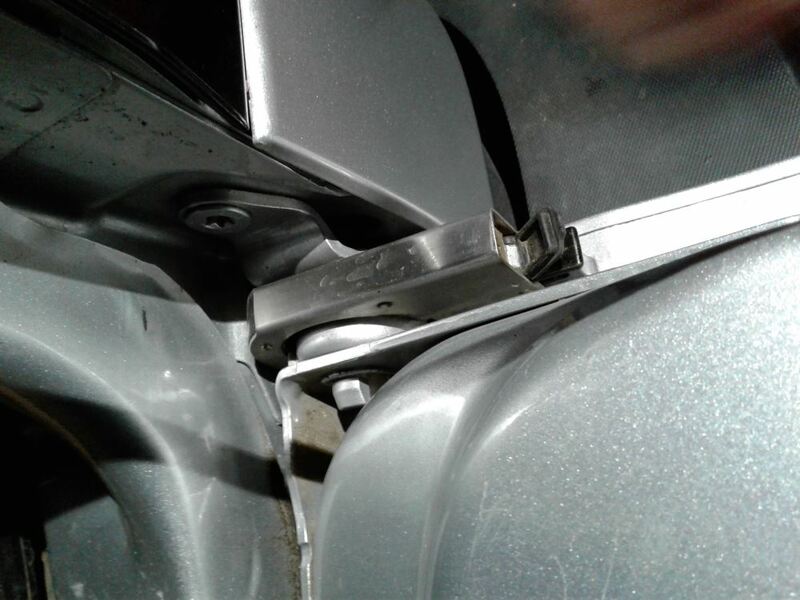 Yes, we checked with Masterlock and they have confirmed the fit of their part # 8253DAT on your 2009 Chevy Silverado 2500HD. One of the Velcro pads that come with the Master Lock Tailgate Lock # 8253DAT attaches to the side of the lock itself while the other goes on the tailgate. You'll want to attach the Velcro to the lock first so you can see exactly where on the tailgate you should attach the other piece of Velcro. I've included a link to a review video of this product for you to take a look at well. For a tailgate lock on your 2001 Ford F-250 with factory locks, you can use the Pop & Lock Custom Tailgate Lock - Power - Black # PAL8250. This will connect to your factory wiring to work with your power locks. 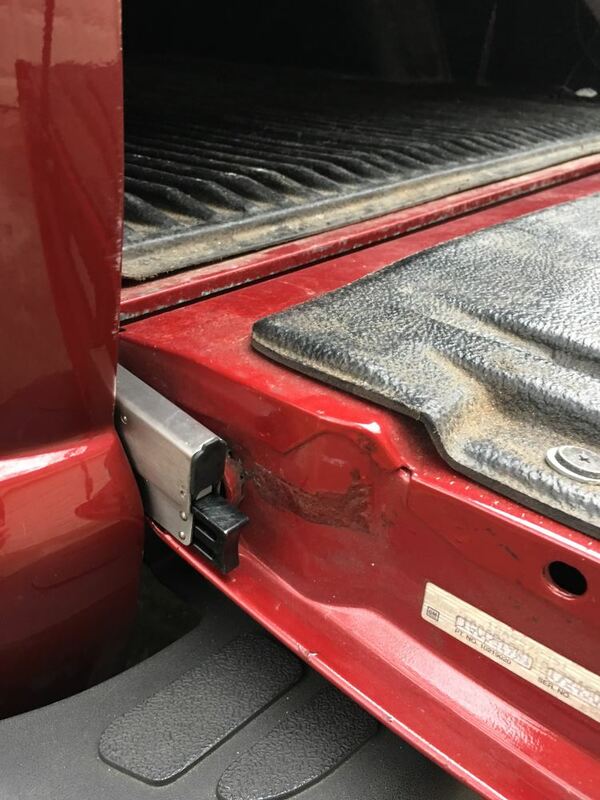 If you want a secondary lock, you can use the Master Lock TailgateLock for Pickup Trucks # 8253DAT or the Pop & Lock The Gate Defender Truck Tailgate Lock for Removable Tailgates # PAL9900. 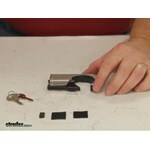 We have not had the opportunity to do a product demonstration video of the Master Lock product. The Master Lock # 8253DAT lock would install just like the Bully # LH-090 tailgate lock. If you look at the video I have linked to, you should have a good idea of how the Master Lock product installs. I personally prefer the Master Lock product, due to Master Locks long history of manufacturing locks, but in this instance, either lock would serve you equally as well. I think that you are going to have the most secure tailgate in the country by using both a tailgate lock like # 8253DAT in addition to a lock at the handle, # PAL2310C. And if you have a tonneau cover on the bed you can lock things in the truck bed just by locking the handle (as long as the cover is the type that can only be opened if the tailgate is down). This set up will work great for you. 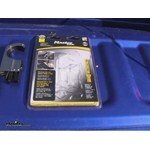 The Master Lock TailgateLock # 8253DAT would work well on your C1500 truck. The LH-090 is discontinued at this time. Personally I like the way the # 8253DAT releases a little better and the fact that it would seem much harder to cut through if a thief was so inclined, plus it has a higher rating with our customers so I would recommend it for you. I attached review videos for both products for you to check out. The only tailgate locks that we have that might fit your 1986 Ford F-150 XL are products like # 8253DAT. They prevent theft of the tailgate but do not make it so that you cannot open the tailgate. I have included some pictures showing the dimensions of the locks so you can determine if they will fit your truck. Yes, the Master Lock Tailgate Lock # 8253DAT is confirmed to fit the 2015 Ford F-250 Super Duty without factory power locks. There isn't a specific vehicle fit list for tailgate lock # 8253DAT. Because of this you will have to go by the measurements. It is 3-11/16 inches long, 1-15/16 inches across, and 5/8 inches wide. Then in the fully locking position the opening is at most 1-1/2 inches across. Your 2008 Ford F-150 is compatible with Master Lock tailgate lock # 8253DAT. There is a Pop & Lock version that is listed as a fit. It is # PAL9900. 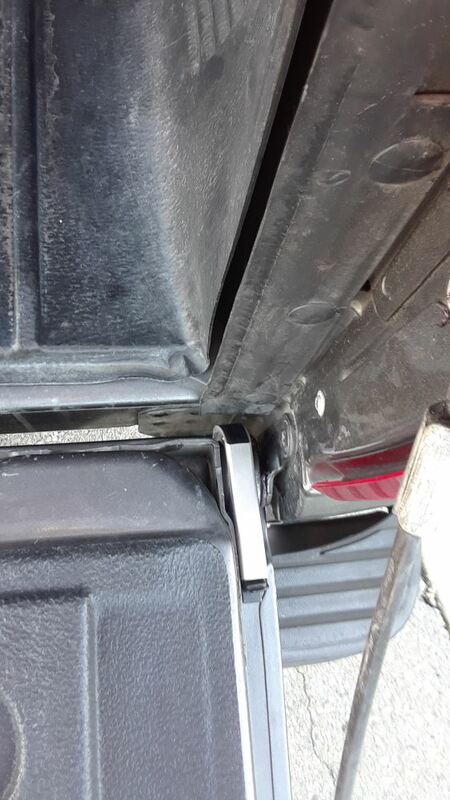 These types of locks prevent theft of the tailgate itself. If you want to prevent the tailgate from opening you could use # PAL8250 but it is only compatible if the truck has power door locks. The Master Lock Tailgate Lock # 8253DAT will actually fit all bed sizes for the 2016 Ford F-250 Super Duty. It will fit your 6-3/4' bed. The Master Lock tailgate lock # 8253DAT does not have a specific vehicle fit list so you have to go by the measurements. I have included a picture showing the overall height and length. The lock is 5/8 of an inch thick. Yes, the Masterlock Tailgate Lock part # 8253DAT is a confirmed fit for your 2011 Chevy Silverado 2500HD and would work well. The Pop & Lock Custom Power Tailgate Lock # PAL8250 will fit on your 2013 Ford F-150 Raptor as long as it came with factory power locks. If you do NOT have factory power locks then you can use one of the other lock products shown on the linked page like # 8253DAT. All accessory items for your F-150 can be seen on the other link.